If you want to surf Texas you have to know where to go. 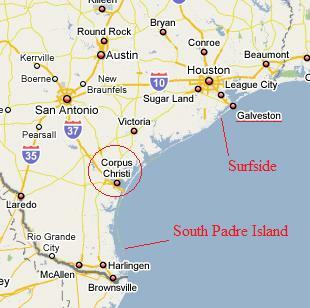 First, the major surf towns, as shown on the map below, are Galveston, Surfside, Corpus Christi, and South Padre. Each surf town has numerous surf spots to choose from. Some days one surf spot might not be hitting very hard while another, just a few miles down the beach, will be producing some nice clean and fun waves. It’s best to be familiar with several spots so you can find the surf. Want information on a Texas surf spot that we don’t yet have on the website? Tell us here.